Villa Alba is part of the Castiglion del Bosco estate which has, at its heart, the Borgo, with two fabulous restaurants, a state of the art fitness and spa complex, tennis courts, one of Italy's newest and most spectacular golf courses, a famous frescoed chapel and a shimmering infinity swimming pool that overlooks both Montalcino and the ranging, raw beauty of the Val d'Orcia. This is a stunning setting: the Val d'Orcia was awarded UNESCO's World Cultural Landscape status in 1996 and it's easy to see why - an artist's dream, the hills gently undulate under a vast sky. Nearby, Pienza is the "touchstone of Renaissance urbanism" and the wine towns of Montalcino and Montepulciano, noted for their rich Brunellos and Vino Nobile, are just a stone's throw away. 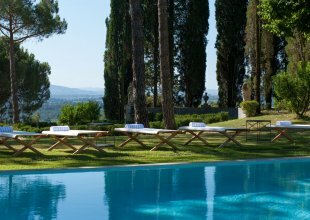 Outside the villa are landscaped gardens and lawns, a heated outdoor pool in natural stone, a pergola-covered barbeque terrace and spectacular views of the surrounding countryside. Inside are designer fabrics, wood and terracotta floors, fabulous high ceilings and wonderful features such as ranging, spacious, well -appointed rooms with antique and handmade furniture. The villa's ground floor is elegant, spacious and homely. The living room has a wonderful authentic Tuscan fireplace. The dining area is beautifully presented and leads into a designer kitchen that might just inspire your culinary skills to come out, or those of your cook! Upstairs there are two beautiful bedrooms each with en suite bathroom. There is also a guest house with a third bedroom with en suite bathroom and outdoor seating area. 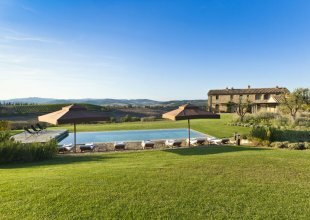 Villa Alba is part of the Castiglion del Bosco Estate and comes with daily continental breakfast provided by the estate, a welcome meal, daily housekeeping and full access to all the estates facilities.